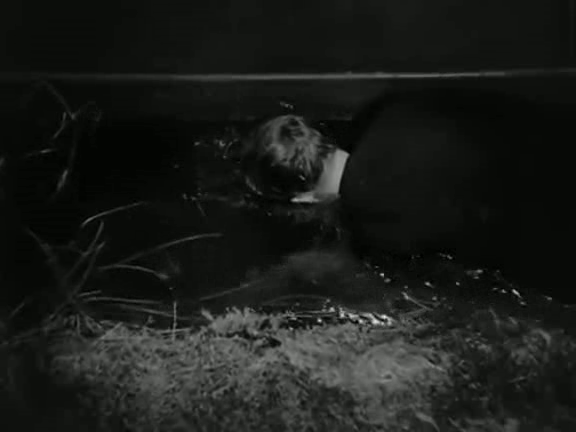 UK / 78 minutes / bw / Signet, ABFD Dir: Phil Brandon Pr: Hugh Perceval Scr: James Seymour Story: The Missing Million (1923) by Edgar Wallace Cine: Stephen Dade Cast: Linden Travers, John Warwick, Patricia Hilliard, John Stuart, Ivan Brandt, Brefni O’Rorke, Charles Victor, Marie Ault, Eric Clavering, Valentine Dyall, Arthur Hambling, Albert Chevalier, Aubrey Mallalieu, Jim Donald, Cecil Bevan. Rex Walton (Brandt) is about to marry Dora Coleman (Hilliard), daughter of treasury official Michael Coleman (O’Rorke). 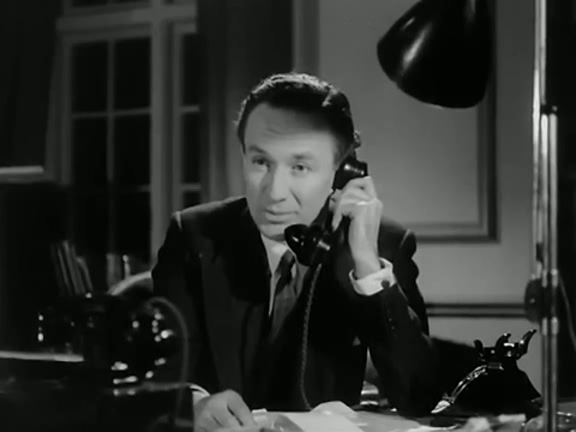 As he and his sister Joan (Travers) visit the Colemans’ stately London house one evening, though, Rex suddenly disappears, and a mysterious phonecall tells Joan that his life is in danger. It proves that there’s a vicious blackmailing gang on the loose, led by a master-criminal—”the prince of blackmailers”—called The Panda because of his habit of leaving a little toy panda at the scenes of his crimes. In reality Rex is alive and free, and is working undercover to try to thwart The Panda, who is trying to make Rex his latest victim. In company with his butler Wells (Hambling), Rex abducts the lawyer Collett (Dyall), who’s Coleman’s nephew and was going to be the best man at the wedding. It emerges that Collett is part of the gang. Rex milks as much information as he can from the man and sets him free; when Collett tries to make a break for the continent, The Panda tracks him down and kills him. By this time The Panda has already killed the Colemans’ butler Parker (Clavering), yet another member of the gang, who was planning to steal a valuable diamond and do a runner. 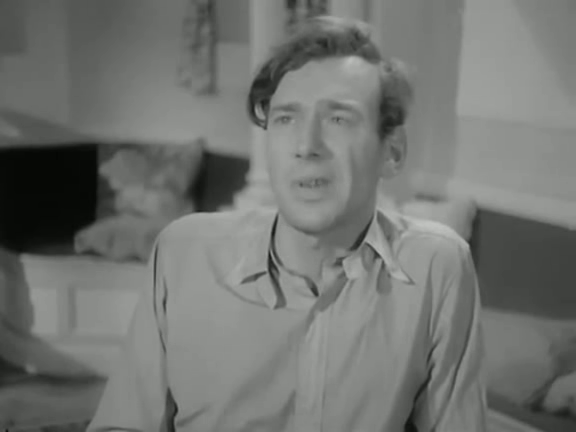 Collett (Valentine Dyall) tries to talk his way out of the latest jam his doublecrossing has gotten him into. Investigating the series of crimes is a strange and rather suspicious Scotland Yard detective, Inspector Dicker (Stuart). He uses Joan as his eyes and ears in the Coleman and Walton households, and the two fairly swiftly become enamored of each other. Dicker of the Yard (John Stuart). 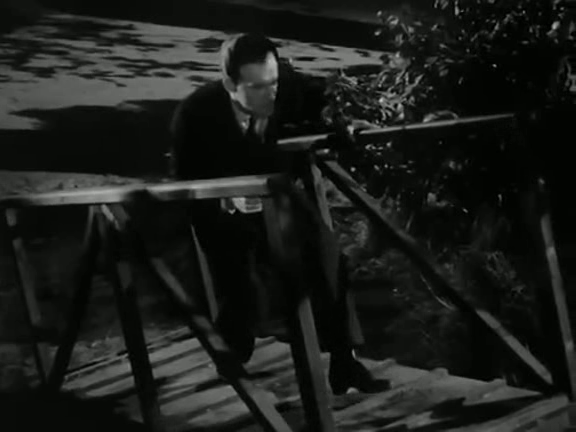 When Coleman has his chauffeur Bennett (Warwick) drive Joan and Dora—plus the Waltons’ housekeeper Tweedle (Ault)—to his riverside cottage so that the two women can get away from it all and try to relax, the stage is set for a dramatic showdown in which The Panda will be unmasked and the air cleared. 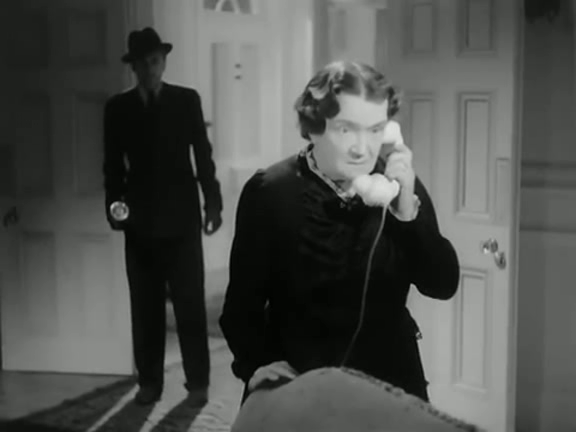 Tweedle (Marie Ault) takes a phonecall, little knowing that behind her . . . In truth, the identity of The Panda is hardly a shock when it’s eventually revealed; it’s been obvious from a fairly early stage. The details of the rest of the scheme do, however, come as something of a surprise—or, at any rate, they did to this viewer. The Panda prowls . . .
. . . but meets a fitting end. 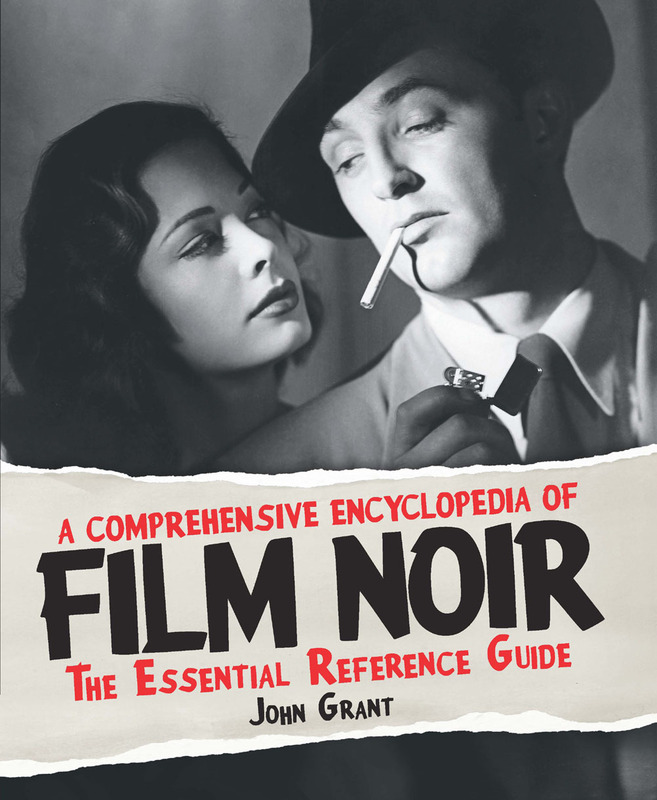 This is a very, very workaday comedy thriller, with most of the action being played as light entertainment and one character—the tiresomely misogynistic safecracker Nobby Knowles (Victor)—being played strictly for laughs. Improbabilities abound, such as that Dicker seems to be flying this case solo and keeping most of it hidden from his colleagues and superiors at Scotland Yard. It seems nobody can pick up a phone without it being mysteriously cut off; in one instance a phone line that was dead mere moments ago seems miraculously to be working perfectly fine again, with no one apparently in the slightest surprised that this should be so. 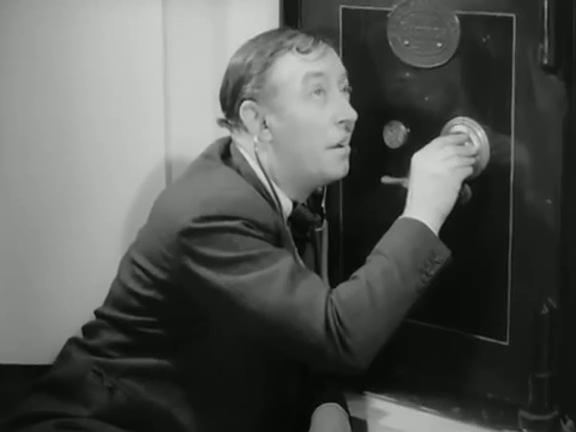 Nobby Knowles (Charles Victor) gets to work safecracking. 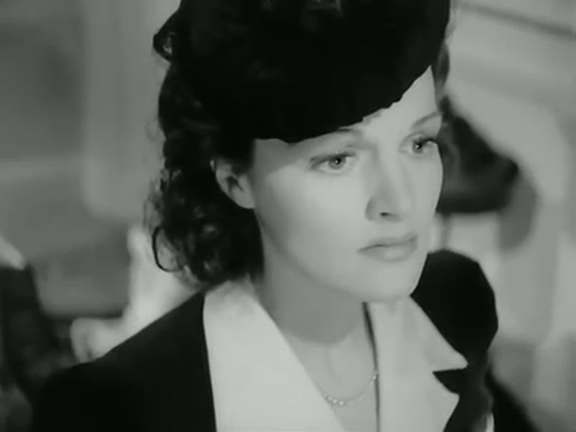 Travers, the elder sister of the actor Bill Travers and through him sister-in-law to Virginia McKenna, was a fairly minor but very watchable UK star, her crowning glory probably coming with her role as the title character of the scandalous—for its day—NO ORCHIDS FOR MISS BLANDISH (1948). The Missing Million represented the last screen appearance of Patricia Hilliard, another minor UK star; Hilliard lived to the ripe old age of 85, and I’ve no knowledge of why she should have abandoned what seems to have been a moderately successful career. John Stuart, by contrast, played in dozens of movies, his last appearance being in Superman (1978). Warwick, an Australian actor of some distinction, was similarly prolific. 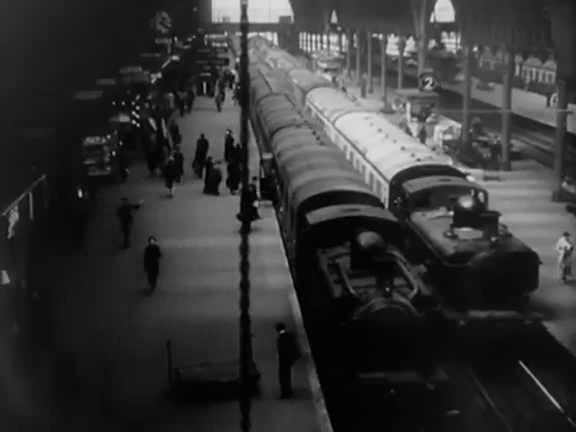 This entry was posted in UK Borderline Noir and tagged Albert Chevalier, Arthur Hambling, Aubrey Mallalieu, Brefni O'Rorke, Cecil Bevan, Charles Victor, Edgar Wallace, Eric Clavering, film noir, Ivan Brandt, Jim Donald, John Stuart, John Warwick, Linden Travers, Marie Ault, Patricia Hilliard, Phil Brandon, The Missing Million (1923), The Missing Million (1942), UK borderline noir, Valentine Dyall. Bookmark the permalink. I’m pretty sure I’ve seen this one as the panda calling-card sounds very familiar! Nice write-up and pics – that’s a great shot of Linden Travers. I did see the “scandalous” NO ORCHIDS FOR MISS BLANDISH at the Film Forum’s Brit Noir Festival a few years ago, and well enjoyed the lead performance of Linden Travers. I bet she was impressive here too, though I am sorry to say I have not seen MISSING MILLION. You have unearthed a slew of moderately obscure titles and you’ve presented them in high flying style on these pages. Perhaps at some point I’ll get to this. Thanks for that, Sam. To be honest, I wouldn’t make a huge effort to see this one; its obscurity is largely merited. Travers is usually good value so might try and track this one down from Network – cheers John.